This new limited edition gamepad allows for hot-swapping between frags and chicken dinner. It never fails that I’ll be sitting at home enjoying some Xbox after a long day of work. I’ll often take part in some of the recently-released PUBG and begin racking up chicken dinners. The problem arises when I try to enjoy the chicken between engagements with other players. 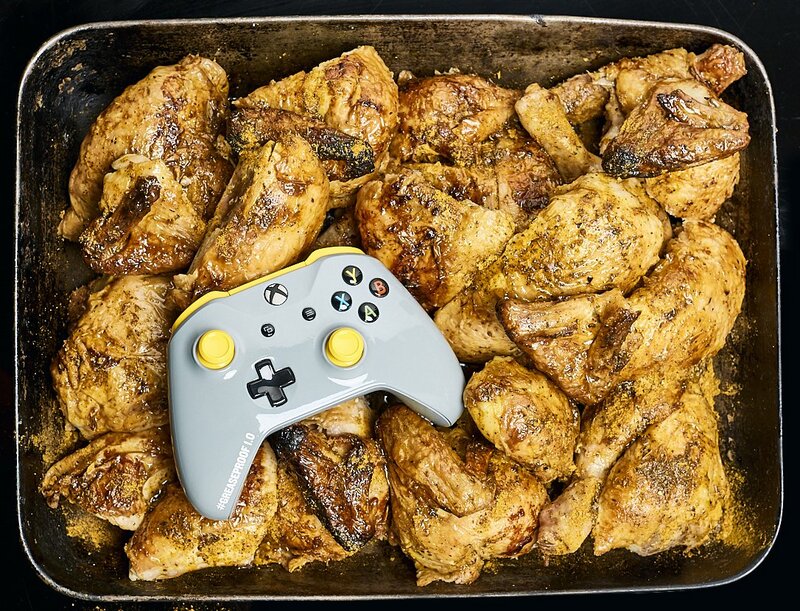 Inevitably, I end up rubbing the grease from my savory roasted chicken dinner all over my Xbox gamepads. Thankfully, the team over at Xbox Australia has my back with the announcement of a brand new greaseproof Xbox One Controller! Commissioned by the Xbox team to commemorate the official release of PUBG out of the Xbox Game Preview program, this new gamepad features a custom paint job featuring a stylish grey with “PUBG Yellow” accents, but the paint job is not the real story here. This controller sports a custom urethane coating that makes it impenetrable to chicken grease (or virtually any other contaminant). You could keister this thing - prison-style - in order to smuggle it into places where Xbox controllers aren’t permitted. The sky is the limit! Limited to only 200 numbered units, this controller will be tough to acquire, but you can try to win one for yourself by entering a contest on the Xbox Australia Facebook page. This is not the only bit of clever marketing from Xbox’s down under squad. When PUBG entered the Xbox Game Preview program in December, the team arranged for the deployment of real PUBG crates in Sydney, Melbourne, and Brisbane. Just last month, the Xbox Games Division showed off a PUBG-branded Xbox One controller at Gamescom in Cologne, Germany, but it just isn’t as impressive as this greaseproof marvel. More recently, the company released the amazing Xbox Adaptive Controller this week. I've never been more proud of my country.